DCR-1020S is suitable for multi-station set position die cutting, laminating. 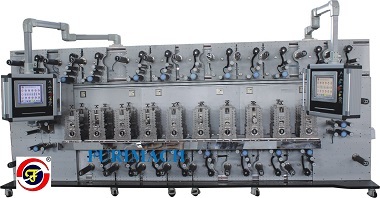 This machine is applicable for adhesive tape, conductive materials, protection film, OCA, sticker, foam, mesh cloth, insulation materials, EMI shielding materials, aluminum and copper foil, back light module, flexible circuit board, medicine and hygiene field, etc. 1. The main operation interface adopts touch panel, with picture display for easy operation. Keyboard, mouse and hand touch are all available. 2. It can save more than 500 kinds of SOP data, improve standard level, and reduce dependence on operator’s experience and reduce more than 60% material waste. 3. All unwind & rewind shafts are driven separately by servo motors. The unwinding, rewinding, straight & reverse rotation is more flexible and controlled by high sensitivity tension sensor shaft’s feedback to ensure smooth running. 4. All cutter holder’s movements are controlled by German Lenze servos motor with enough torsion, stable acceleration and deceleration, precision can be ±0.075mm. 5. The control system is operated by German Lenze PLC and logic movement controller with better synchronism. 6. 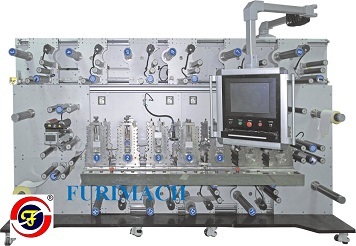 Machine has the function of asynchronous laminating which can save material. 7. Movable auxiliary unwind shaft. 8. Main unwind EPC system can stabilize the material feeding into blade holder. 9. Fracturing detecting (including transparent material) machine stop or alarming to reduce material waste. 10. CCD (Charge-coupled Device) testing system can test position precision all the time during the whole process and then feedback to PLC which send orders to servo motors to adjust position. 11. Color code photoelectric eye tracking system can meet the demand of position precision of produce printing product. 12. Machine can process two different types of materials at the same time which improve capacity utilization.